Sounds like Dr Seuss , doesn’t it? Thing 1 and Thing 2….Well, yes, I still have my sanity. And I am still laughing. 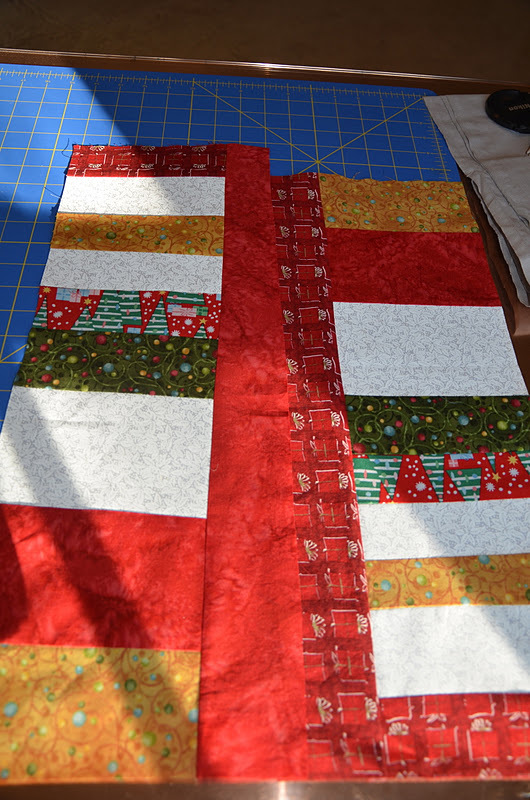 I did finish some gifts so that made me feel a little better and hope to move on to the prep for the holidays after this weekend. 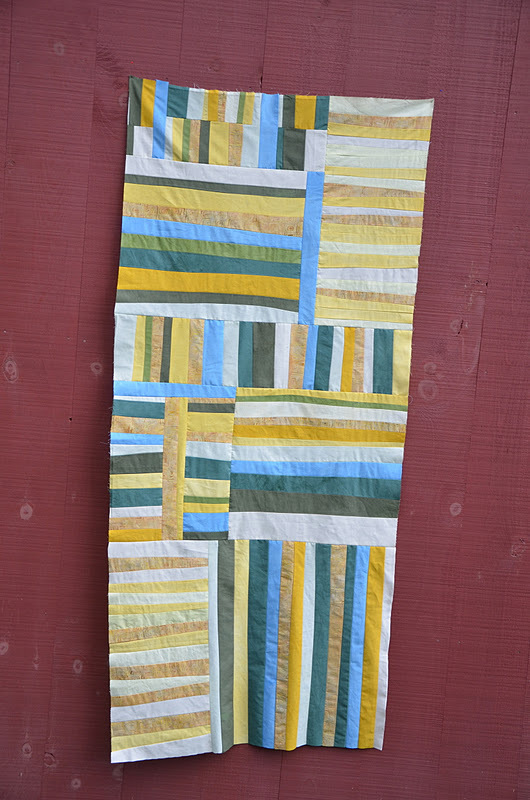 My family party is this weekend so I am glad I finished my sister’s quilt in just the right amount of time to say-woo-hoo I finished just in time! Quick, easy and simple and hopefully, exactly what she wanted. She wanted one print and the rest solids- many years ago when she requested one. So we’ll see. 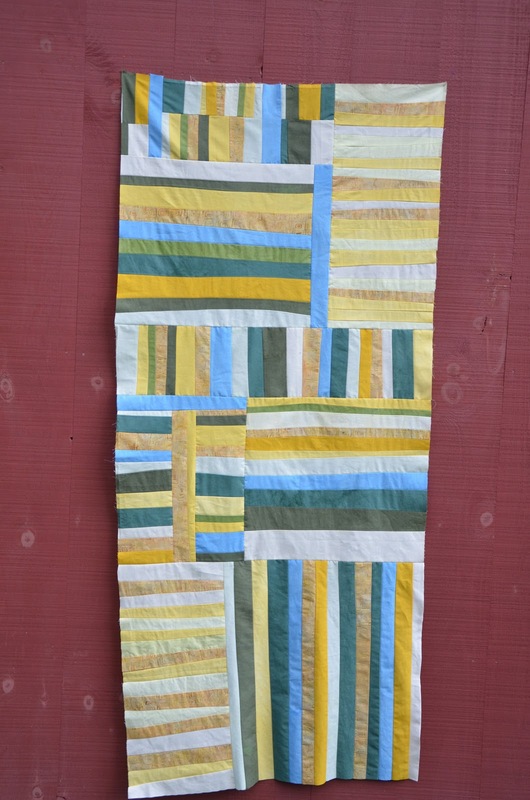 If she doesn’t want it, my husband said he is the taker of this quilt. That really surprised me. This was just fun to do as I had no expectations as to what wonderful art it needed to be. And to think it was for my sister really added to the joy of planning it and completing it. And thing 2 and thing 3 are done too. This is a scarf for the rather selective daughter written about previously. These are her colors and the color of her coat so let’s hope she likes it. If not, I have purchased the perfect tag for her present. I have kept it a secret so we’ll see about this too. At the end of last night when I had finished three gifts, I wondered: Do we not make gifts for others because we feel our gift is ” inadequate” or because the amount of work is just too much? I think I feel self conscious that they might not like what I have made for them. Or that it will not measure up to what others have made. I am 50 years old- not in high school anymore. Time to get over it and have some self confidence I think. I do enjoy making for others. That has been my fun this Christmas! 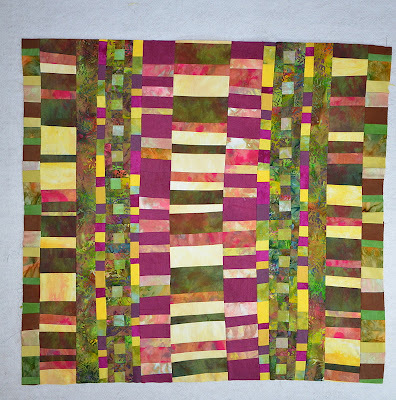 This entry was posted in quilts 2011 on December 15, 2011 by Colleen Kole. 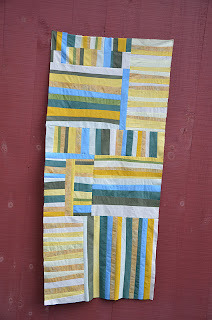 I have finished a few small projects that have been hanging around way too long. The first one is a Christmas present for my daughter. It is the softest alpaca and she has been impatiently waiting for it once she snuck a peek at it. She has to wait a little longer though. I just needed to rinse it out and it will be ready for the stocking. 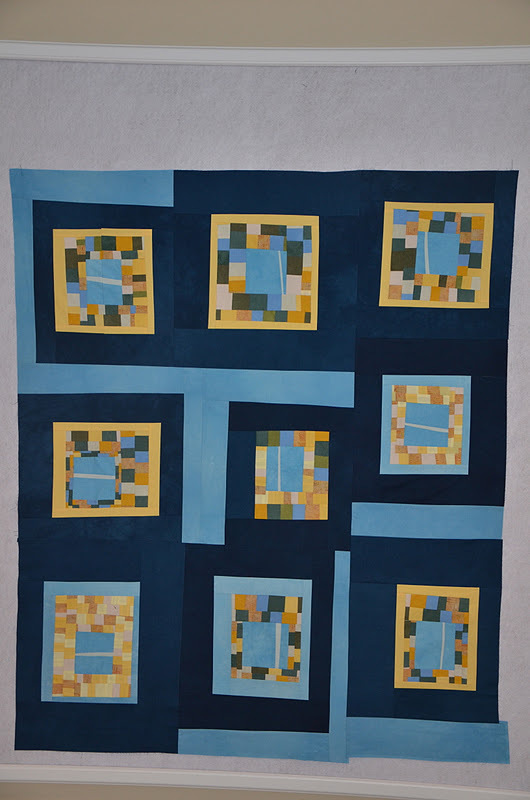 I also finished and delivered to our guild a little doll quilt and remembered at the last minute to take a picture of it. ( not a great picture) It turned out large enough for the doll and the girl to snuggle under-about 24×36. At lastly, I finished this small piece last night. I had wanted to practice some “extreme” stitching before I started another piece and this worked out really well for that. I also had wanted to try to mount something to a canvas and last week I found this little pre-painted canvas from Michael’s (yes, always use the coupon) which would work for it. Again, I had an awful time trying to photograph this morning as it is dark and rainy. I enjoyed how it turned out and have a few more canvases to try this again. I’d like to have four to mount together on a wall. And re-take the photos will be added to the to-do list. Felt good to finish something as it has been awhile. 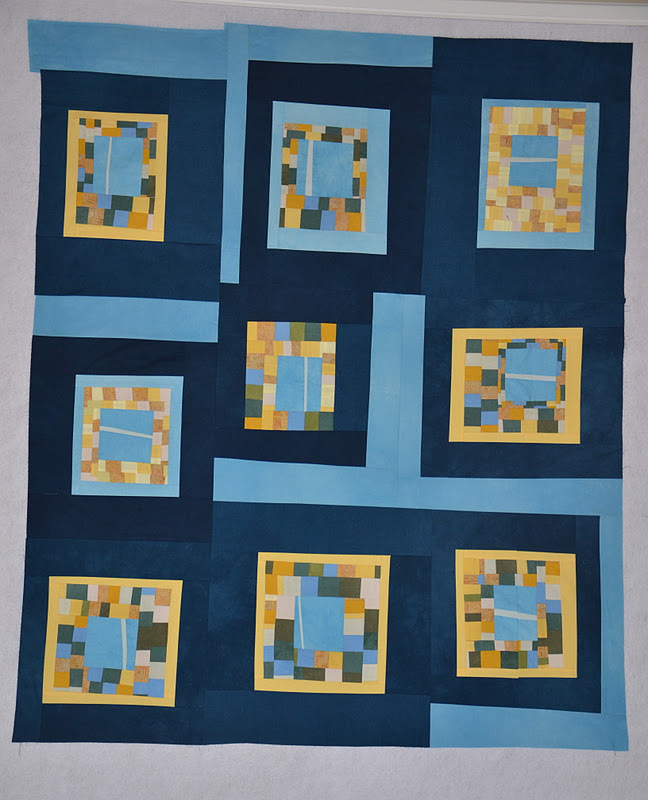 I have my sister’s quilt assembled on the design wall so next up this week will be sewing the top together. Happy sewing. It really is peaceful to sew. 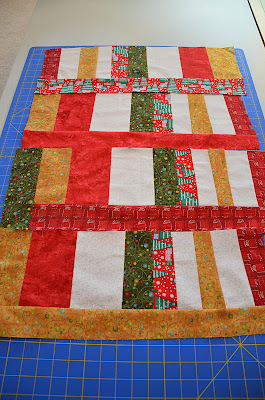 This entry was posted in Christmas 2011, quilts 2011, Slow Cloth on November 29, 2011 by Colleen Kole. I had forgotten how much fun this is. When you don’t like something, chop it up and use it for something else. The last piece I made this summer was really bugging me I guess because I could have done better and the colors just didn’t feel right to me. I didn’t want to spend loads of time taking it apart and trying to make it work. So a quick decision was made to re-purpose it. I love that word re-purpose which removed all the guilt of having it lay there in my workbasket for the next ten years because I hated it. This time I thought I would actually use this re-purposed piece for something functional and make it a soft quilt to use while you read or watch tv in Vermont. 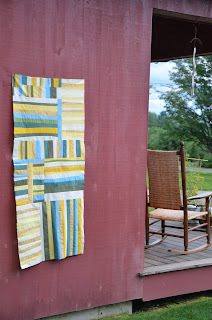 The throws that I have there are embarrassing-in a home where one sews regularly! It took a little longer than I thought but I am ok with how it turned out. Much better than not being used at all or sitting there undone for years. I realized as I flipped the photos to see which way it looks better that it didn’t matter because it wasn’t intended to be hung. Fun and easy to do. 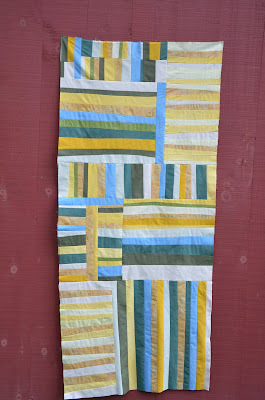 All the pieces and parts for the squares came from this original piece which felt like a silly beach blanket. Maybe I should see what else I could chop up…. Be creative, my friends! 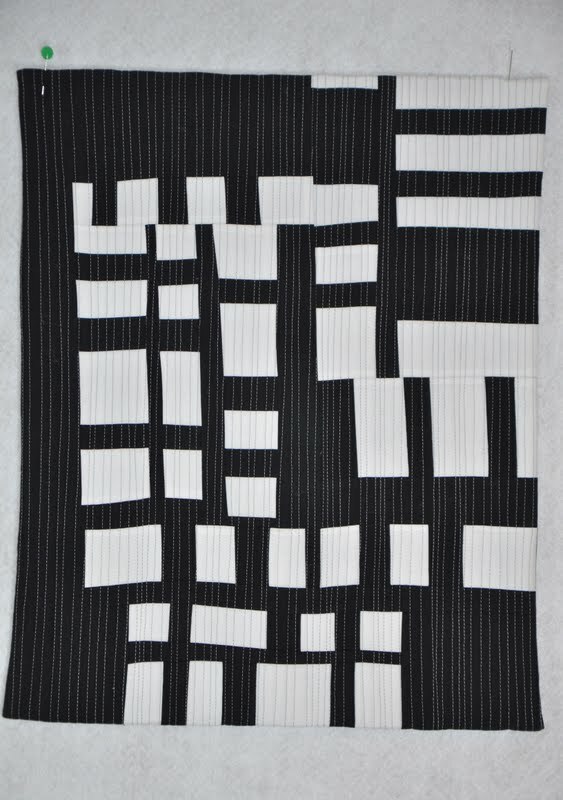 I hope to go to a 3 hour lecture on machine quilting tomorrow. What are you up to with your art this weekend? This entry was posted in quilts 2011 on October 28, 2011 by Colleen Kole. I really am not looking forward to the next class I am registered for. And I knew, that as my week passed, I really better have an attitude adjustment. It wasn’t the amount of work or the inability to want to stretch a little further. I kept thinking about what my problem was with the class and after quite a bit of time wasted on figuring out my dread really was, I finally figured it out. Two dreaded words: black and white. I know the first exercise will be working in black and white. It makes me shudder just thinking about it. 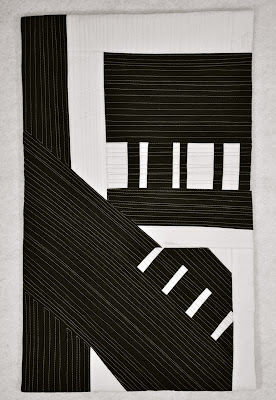 So, the only cure for my dread: get out the black and white fabric and get to work. I wear black all the time. So what is the problem? With a black and white piece, you can see all the design flaws up close and personal. Keep going. Keep going. Get it out anyway. Make a small piece and move on from there. So, I did. I even finished it. Just to remind myself that black and white isn’t so scary even though you can see all the design flaws. I see what I don’t like but I also see what I do like. It is a start. 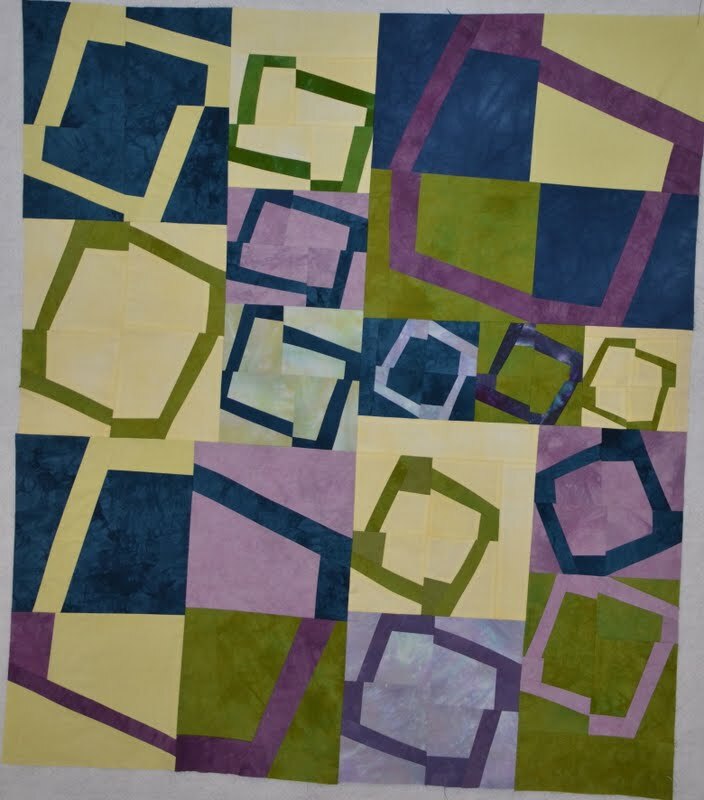 This entry was posted in process of becoming an artist, quilts 2011 on August 30, 2011 by Colleen Kole. Well , I guess maybe a finish. 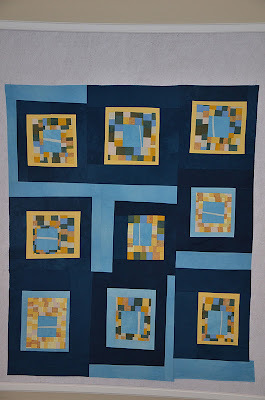 I struggled this week to just barely finish piecing this. I am not very excited about this because I felt so RUSTY. I have learned something very important though. Never stop working. Just keep going with some part of the process. 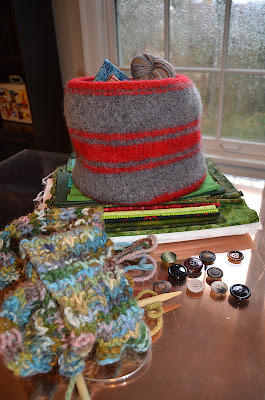 I kept justifying the dyeing as part of the process. It is. But the designing and actual production of my design is the part that must be done -for me. All the time. I see many things about this I don’t like but it’s a start and I will finish this one. And I will keep going with this series. Just felt good to keep pushing through. In just fifteen minute increments this week, I was able to do it. My oldest is moved back to college and the younger kids go back to school on Monday. I am ready for a regular schedule as much as I have enjoyed my summer. Be creative, my friends. I can hardly wait. 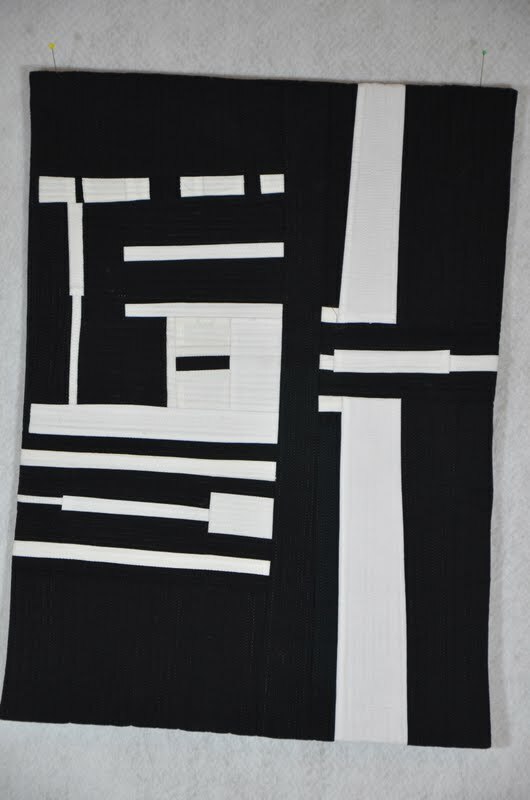 This entry was posted in process of becoming an artist, quilts 2011 on August 26, 2011 by Colleen Kole.